September 16, 2018, Mexican Independence Day celebrated: Grito de Dolores! It’s almost painful how much residents of the U.S. don’t know about our neighbor to the south, Mexico. No, Cinco de Mayo is not Mexican Independence Day. That would be September 16. Mexico’s Independence Day is celebrated on September 16. But just to confuse things more, Mexico did not get independence on September 16. September 16 is the usual date given for the most famous speech in Mexico’s history — a speech for which no transcript survives, and so, a speech which no one can really describe accurately. A Catholic priest who was involved in schemes to create an armed revolution to throw out Spanish rule (then under Napoleon), thought his plot had been discovered, and moved up the call for the peasants to revolt. 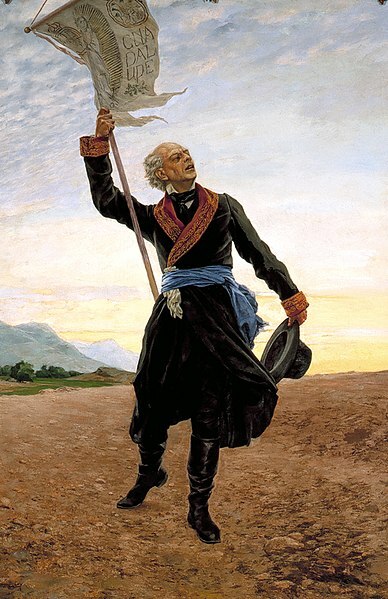 At midnight, September 15, 1810, Father Miguel Hidalgo y Costilla declaimed the need for Mexicans to rise in revolution, from his church in the town of Dolores, near Guanajuato. The cry for freedom is known in Spanish as the Grito de Dolores. Hidalgo himself was hunted down, captured and executed. Mexico didn’t achieve independence from Spain for another 11 years, on September 28, 1821. Long live Galena and the Bravos! Political history of Mexico is not easy to explain at all. Hidalgo’s life was short after the speech, but the Spanish still feared the power of his ideas and names. In Hidalgo’s honor, a town in the Texas territory of Mexico was named after him, but to avoid provoking authorities, the name was turned into an anagram: Goliad. In one of those twists that can only occur in real history, and not in fiction, Goliad was the site of a Mexican slaughter of a surrendered Tejian army during the fight for Texas independence. This slaughter so enraged Texans that when they got the drop on Mexican President and Gen. Santa Ana’s army a few days later at San Jacinto, they offered little quarter to the Mexican soldiers, though Santa Ana’s life was spared. Have a great Grito de Dolores Day, remembering North American history that we all ought to know. Check out my earlier posts on the Grito, for a longer and more detailed explanation of events, and more sources for teachers and students. This entry was posted on Sunday, September 16th, 2018 at 2:26 pm and is filed under Freedom - Political, Grito de Dolores, History, Mexico, Revolution. You can follow any responses to this entry through the RSS 2.0 feed. You can leave a response, or trackback from your own site. 2 Responses to September 16, 2018, Mexican Independence Day celebrated: Grito de Dolores! Mexican historians, and some of the military officials of the time (including General José Urrea) objected to the order for the “slaughter of a surrendered Tejian army” but it was neither an army, nor Tejano under the legal assumptions of the time. The Goliad victims were overwhelmingly armed foreign invaders while the others were “illegal aliens” taking up arms against the legitimate government. Or so “our version” of the event goes here south of the Rio Bravo del Norte. Thanks for the reminder of what September 16 is for. Celebrations were quiet here in South Texas…perhaps it was the rain.